Wondergy is seeking charismatic skateboarders with street and freestyle chops. 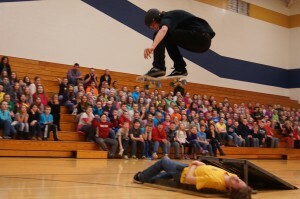 You’ll be part of an unscripted interactive show about the science behind Skateboarding, engaging with students’ questions and ideas, and making it fun, educational, and exciting. If you go on tour, you will visit over 80k students in over 30 states, and make a huge impact on the world. This is a full time job on the road, requiring a lot of driving. We provide all of the equipment for travel and science demonstrations, plus training and general support. Perform some Freestyle/Flatland, some Street skating with Obstacles (Wedge Ramps, Rail, Fun Box, and small launch ramps). Sorry, quarter and half pipes won’t fit in the vehicle. Pack, setup, re-pack demo and sound equipment. No sales duties. You’ll be sent a schedule each week. Able to Ollie reasonably high and far off a kicker. Able to perform basic flip tricks consistently, esp. 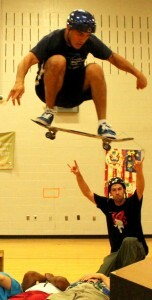 kickflips or heelflips, 360 shuvits, treflips. For academic year 2017-18, Wondergy will be sending three interactive shows on tour across the country. These will be our 12th-14th national tours, and our 6th year of touring. Crash into the physics of safety by lying across a bed of nails. Find the physics of balance by levitating students. Make pigs fly to explore how big-air tricks and jumps work. Bring the science of the Ollie to life! Based in west Philadelphia since 2003, Wondergy uses science to educate, change attitudes, and affect behavior. The Wondergy team brings knowledge, experience, and personal excitement about science to create exciting, inviting interactions that empower people to learn about the phenomena that matter to them. Through promoting learning, we build a stronger workforce, smarter consumers, and more informed stewardship of our world. Email us your resume and cover letter, and a short video telling us why you’d be awesome for this (youtube/vimeo links are great). We will have a phone interview, which may be followed by an in-person “audition”. Check out http://wondergy.com/tour for more information on our current tours. Email to careers@wondergy.com only, and be sure to include your phone number; no inquiry calls, please. Your tour would look something like the purple dots below – this is last year’s tour map.